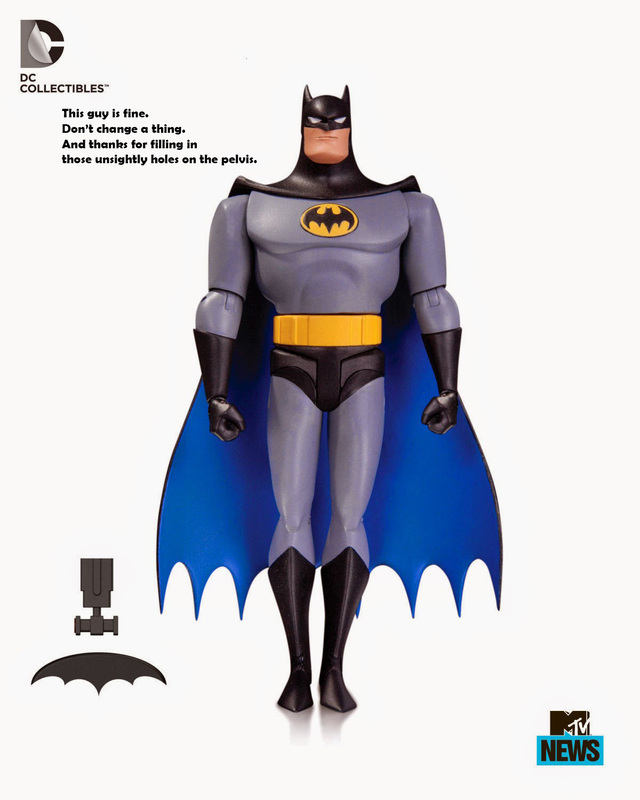 I could not be more excited by DC Collectibles new line of animated style BTAS and TNBA figures! THESE are the toys I’ve wanted for over 20 years! The first wave is out now. I hope to obtain my set very soon, and then maybe I can finally answer everyone who keeps asking my opinion of them. 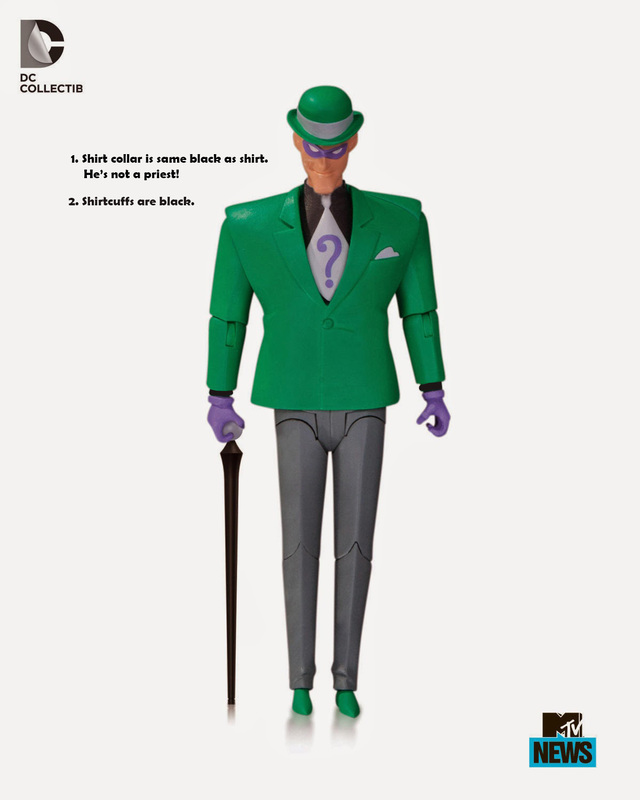 Yesterday, DC Collectibles revealed photos of the upcoming wave 4. Another round of great characters, but this time, something seemed off. Look, DCC, I’ll be honest with you. I’ve been customizing, building, and painting these characters in this style since the show premiered, probably longer than some of you have been in the business. So please understand me when I say I mean you no disrespect, but you missed a few details. Next time, pop in some DVDs for reference. It’ll save you some effort later on. To that end, I have taken it upon myself to fix some issues, via your photos. Most are paint issues, so they should be easy fixes. But Penguin’s monocle…. That’s awful. You’ve got to correct that. I can’t believe I’m going to say this, but Kenner got that part right 22 years ago. UPDATE: Jason Geyer pointed out I failed to mention the many, many failures of the sculpts. I agree that Riddler and Penguin look off physically, and even Bats could use some toning up. I suppose my original intent was to focus on the paint issues, since those are easy to fix. 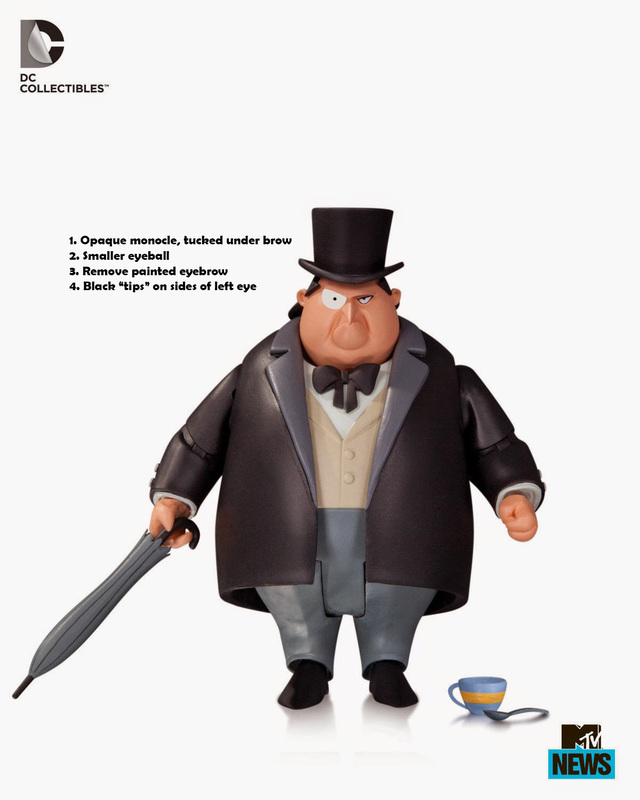 Aside form Penguin’s monocle, I’ve little hope the sculpts will be improved. Ummm… While I completely agree with most of your other points, Batgirl is actually more accurate as-is. 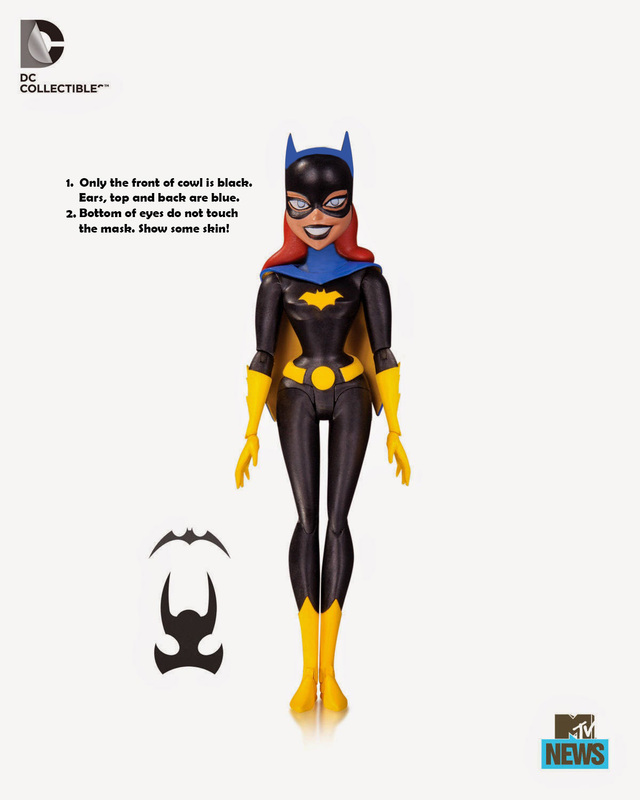 While the cowl IS black only in the front during the TAS era, TNBA-era Batgirl’s cowl is black from the neck up. If anything, they need to get rid of that stupid shine streak across the top. What bothers me more than sculpting problems, paint errors, or the numerous complaints of limbs snapping off is the insane pricing on these. The first eight are going for about $25 each on Amazon.com, which is about twice what I want to pay. But the next group of figures – including Tim Drake Robin and the Creeper – are listed at $40 each! Imagine how much a large sculpt like Clayface would cost (homemade resin castings might be cheaper!). And it appears that they plan on both B:TAS and TNBA versions. I know, DC makes more money on merchandising than on the books, but dear lord, they’ve gone crazy with figures (New 53, Adam West/Batman, video game likenesses, Earth 2, etc. ), and vinyl figures, block figures, Dinkies, Squinkies, Twinkies, and on and on. And all of them overpriced. Don’t even get me started on justice league mighty mini figures. We have the first few waves here in the UK now showing up in the discount stores. I paid top dollar for them.